Nollywood actress, Funke Akindele aka Jenifa, is expecting her first child with her hubby, JJC Skillz. The beautiful actress and wife to popular Singer stepped out yesterday afternoon for the Glo Lafta Fest 2017 that was held in Festac, Lagos, rocking a huge baby bump and this has triggered major excitement among fans, especially those who followed the sad drama on social media after the founder of Mountain of Blessing and Miracle Church of Christ, Dr Olagorioye Faleyimu, said the actress would never have children in this lifetime. Recall in June, news broke that the actress was pregnant, when her husband had left a note on his Instagram page, testifying during the “Olowogbogboro” movement. A report that was later twisted when he said, it wasn't true that he was only tapping into the hallelujah challenge blessing. 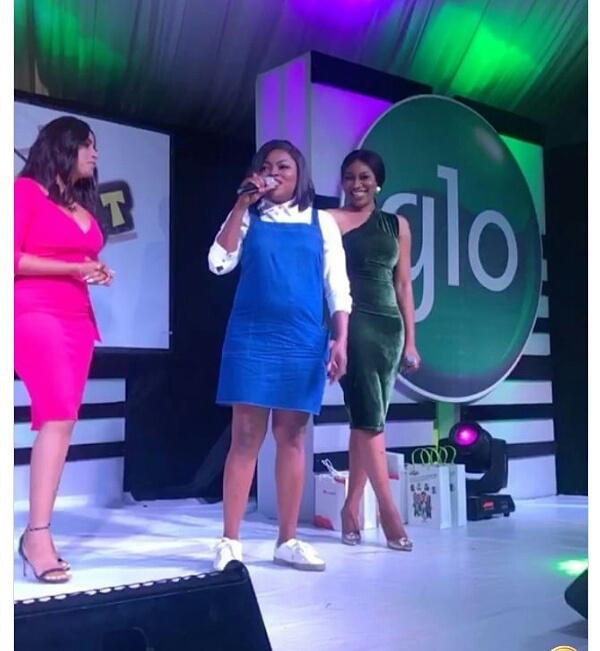 Well, it turns out that the Funke Akindele is unmistakably pregnant, and though she has yet to speak since the news surfaced, her fans are already celebrating on social media.